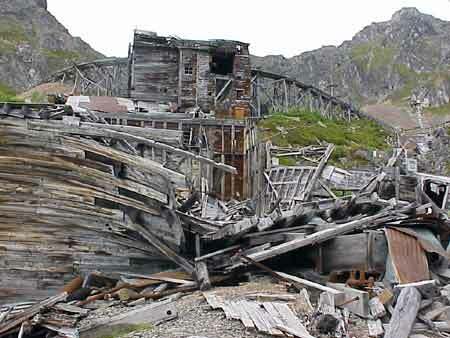 The rubble of decaying buildings fills the foreground in this photo that also shows the tracks leading into the shaft of Independence Mine in Southcentral Alaska. The role of gold in Alaska's past and present is hard to overlook. There are evidences of it everywhere, in everything from events like Fairbanks Golden Days and Valdez Gold Rush Days, to hotels with names like Golden Nugget, Motherlode, Golden North, and Gold Miner's, to the gold exhibit in the University of Alaska Museum in Fairbanks and to gold nugget jewelry and painted goldpans in gift shops throughout the state. Finding gold in Alaska is hard work and there's evidence that it's easier to get rich supplying gold prospectors than by prospecting. Still there are tales or people like a DWI attorney Houston who finds a nugget that more than pays for his trip from Texas. Don't be fooled by the gold prospecting TV shows or the stories though, many, many tourists leave the great state of Alaska empty-handed. Gold was first discovered in Southeast Alaska in the 1870s. The first discovery was made near Sitka in 1872 and the second was made in 1876 in Windham Bay. These finds followed the discovery of gold nearby in British Columbia in 1861. Alaska's first big gold strike came in Juneau in 1880 when two prospectors guided by an Indian found "large pieces of quartz, of black sulfite and galena all spangled over with gold" in a creek that, of course, is now called Gold Creek. On their initial trip they collected a thousand pounds of ore. The city itself is named for one of the miners: Joseph Juneau. Richard Harris, the other miner, gave his name to the Harris Mining District. Their find led to the discovery of a lode of gold quartz that has supported mining to the present day. Gold strikes in the Klondike and near Nome brought prospectors to Alaska in the 1890s. Many of them took steamships to Skagway in Southeast Alaska, where they began their trek by land to the Klondike. One of the most famous photos from the gold rush era shows a long line of miners struggling up Chilkoot Pass on the Chilkoot Trail near Skagway. Further west along the coast, Valdez was another port of entry for Klondike miners and it also has a gold rush trail, now being restored, in Keystone Canyon and Thompson Pass. Far to the north, the discovery of gold at Anvil Creek in 1898 brought thousands of fortune seekers -- including Wyatt Earp -- to the Nome area. Then gold was discovered on Nome's beaches, and gold seekers continue to make finds there today. Some of them can be seen straining gravel in their sluice boxes along the shore, perhaps hoping to find enough gold to pay for their annual summer trips to Nome. A major commercial gold dredging operation was conducted offshore in the 1990s. The gold rush gave many communities in Alaska their start. Fairbanks, on the Chena River, became an important supply post as well as a center of mining activity after gold was discovered in a creek north of town in 1902. And today major gold mining operations continue in the Fairbanks area. 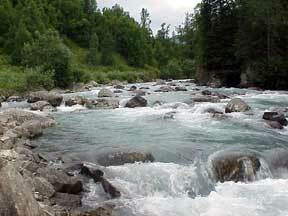 Visitors can tour some of these and also try their hand at panning for gold. Further south, Talkeetna, also located on a river, was another place where gold rush-era miners stopped to stock up. Wasilla was established a few years later, in 1917, when the Alaska Railroad built a depot there as a shipping point for gold miners. Hope, on the Kenai Peninsula, was a bustling community of 3,000 during the Cook Inlet Gold Rush of 1895-98. Today its population is only 200, but the hunt for gold continues there. Independence Mine was a working underground gold mine in the Talkeetna Mountains near Wasilla and Palmer until war intervened and gold prices fell in the early 1940s. Today it is a state historical park. It was closed during the summer of 2000 for renovations that included improved wheelchair access and paved paths among the buildings, several of which are in much better shape than the ruins in the photo at the top of this page. The most recent gold strike appears to be the biggest. A huge gold and copper deposit has been found near Lake Iliamna, about 235 miles southwest of Anchorage. It is estimated to contain 31.3 million ounces of gold and 18.8 billion pounds of copper, as well as other minerals including molybdenum, making it the largest deposit of gold and second largest deposit of copper in North America. The Pebble mine would be developed as both an open pit and underground mine, but it is not yet certain that will happen in the near future. Issues that must be addressed include construction of a 100-mile access road from Cook Inlet to the site, disposal of tailings so they do not threaten the headwaters of major salmon-spawning rivers, and provision of 275 megawatts of power to the site. Recreational gold panning is allowed at three state parks: Chugach State Park, Independence Mine - State Historical Site and Kenai State Park. Information about rules for gold panning in these areas can be found online. Today more goldpans are made as souvenirs than for goldpanning. Goldpans with scenes painted on them can be found in most tourist stores. They come in sizes ranging from refrigerator magnets to sizes suitable for wall mounting. Alaskans also often receive engraved goldpans as awards for accomplishments or as goodbye gifts when they leave the state. 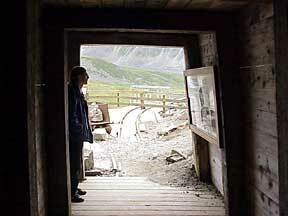 The AJ Mine in Juneau and the historic Independence Mine east of Anchorage are underground gold mines. Gold is mined in open-pit operations near Fairbanks. And dredges used in mining can be seen in Fairbanks and Nome. Miners using sluice boxes may be seen on Nome's beaches in the summer. Miners -- amateurs and professionals -- may be seen panning for gold in streams in many parts of the state, including at Kantishna in Denali National Park and at Crow Creek near Girdwood. The Alaska Department of Natural Resources has information about recreational gold mining.